Today, the day after Germany defeated Argentina to win the 2014 FIFA World Cup Final match, Adobe shared its latest data set of World Cup insights and statistics with the Sports Techie community blog, including numbers reflecting online video viewing, social media buzz and World Cup sponsors activity. 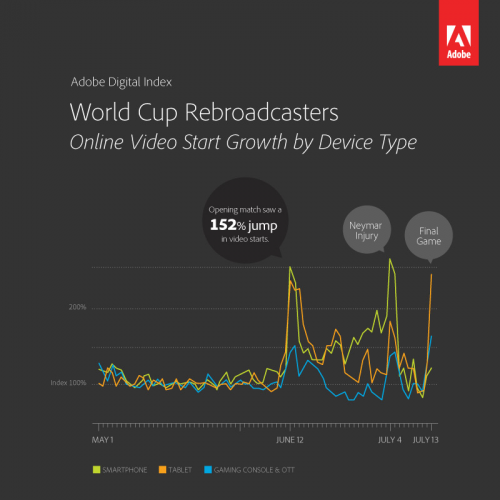 The custom Adobe Digital Index (ADI) report follows up our previous World Cup buzz blog. This post-World Cup data analyzed over 2.7 billion online video starts of smartphones, tablets, gaming consoles and OTT devices in addition to 100 million social mentions captured through Adobe Social with the term “World Cup” being tracked in more than 36 different languages. The Big Data 2014 FIFA World Cup Brazil breakdown indicates that digital history was made after numbers show it to be the most mobile sporting event of all time. TV is still king, however, this trend towards more and more users watching on mobile devices streaming video bodes well for future broadcasts and marketers as more and more fans seem to enjoy mobile sports as a primary or second screen experience. According to CMO by Adobe, “ESPN data goes down in history as the most mobile sporting event ever, with recent data from ESPN showing it surpassed Super Bowl XVVIII.” CMO.com goes on to say the ADI analysis is in line with that fact. ADI’s proprietary analysis of more than 2.7 billion World Cup rebroadcaster online video starts captured by Adobe analytics revealed during peak days, nearly one in four online video starts occurred on mobile (16%) and tablet devices (7%), an increase from the 18% combined for both smartphones and tablets pre-World cup. 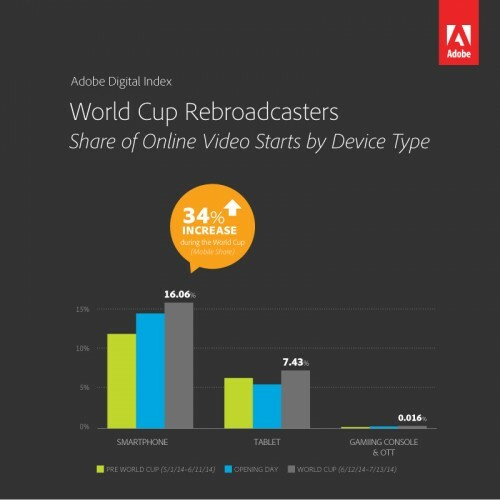 ADI’s proprietary analysis of more than 2.7 billion World Cup rebroadcaster online video starts captured by Adobe analytics revealed during peak days, nearly one in four online video starts occurred on mobile (16%) and tablet devices (7%), an increase from the 18% combined for both smartphones and tablets pre-World cup. The World Cup was the most mobile sporting event ever. Video viewing via mobile devices increased 34% during the World Cup. On peak days, nearly 25% of online video starts came from mobile devices, up from 18% pre-World Cup. Social media played a large role in boosting online video starts through video referrals. Facebook referral video starts increased almost 100% for the opening match, and Twitter referral video starts increased 158%. Tumblr, although small in overall percentage, saw the largest boost in referral video starts with a 406% increase on opening day. Further analytics tell us the opening match increased 152% in video starts from smartphones from a daily average pre-world cup. Social media played a large factor in the World Cup being the largest talked-about event in history. This ADI World Cup advertiser data was collected from analysis of 100 million World Cup mentions compiled from Adobe Social technology via blogs, Facebook, Google+, Reddit, Twitter, Dailymotion, Flickr, Instagram, Tumblr, VK, Disqus, Foursquare, Metacafe, WordPress, and YouTube. The phrase “World Cup” was tracked in more than 36 languages. 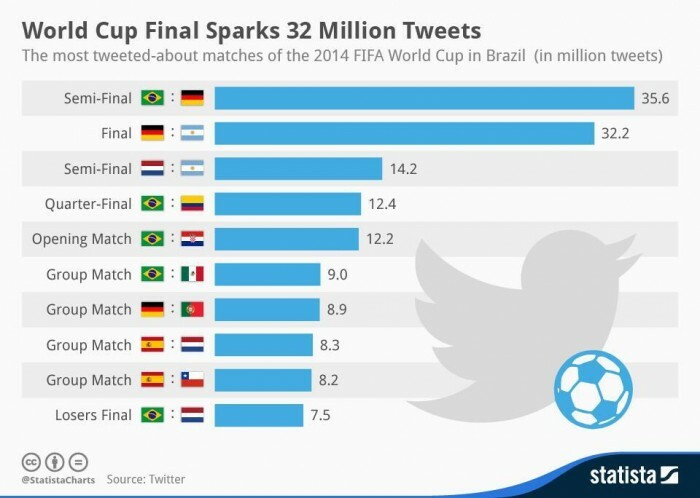 Social media played a major factor in the World Cup being the largest talked-about event in history, especially Twitter and Facebook. Social media played a major factor in the World Cup being the largest talked-about event in history. 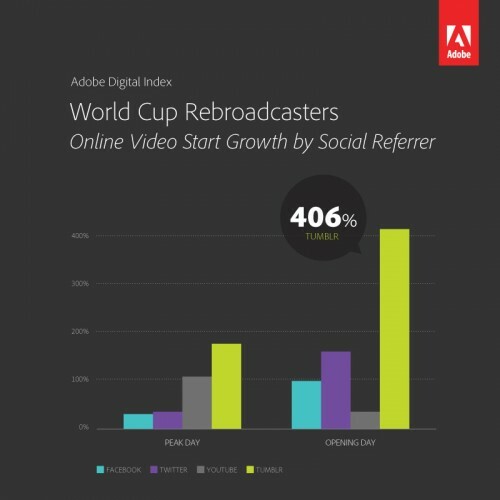 Facebook, Twitter, Tumblr, and YouTube all reaped referral video start increases over May 2014 during the World Cup, according to ADI. Tumblr was small in overall percentage, yet witnessed the biggest increase in referral video starts percentage, with a 406% increase on opening day and 176% during peak days. ADI data further shows that Facebook referral video starts increased almost 100% for the opening match, compared with the average day in May, and Twitter referral video starts increased 158%. Global sentiment of the World Cup was mixed with 41% of buzz related to sadness or disgust while 45% related to joy or admiration. Brazilians were crushed about the loss to Germany with 55% of Brazilian social mentions relates to sadness, disgust, anger, or surprise after the loss to Germany. In the final match, Mario Goetze’s winning goal scored him 1 million+ mentions. Germany and Argentina ended the tournament in the top tier of social mentions for World Cup teams with 30 million+ combined mentions. FIA World Cup 2014 Sponsors Saw A Strong Lift In Social Buzz. 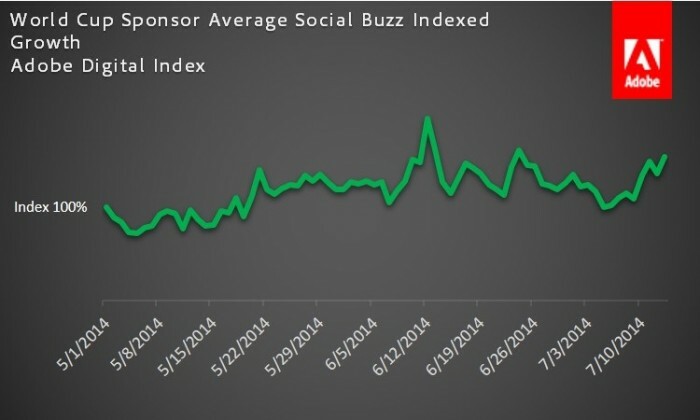 Sponsors saw a strong lift in social buzz. On average, World Cup sponsors have seen a 125% daily social buzz increase over the May daily average. CMO explained that World Cup sponsor Adidas averaged 71% more daily championship-related social buzz social buzz than rival Nike, who was not an official tournament sponsor. As a sponsor, Adidas received more daily World Cup related social buzz than Nike who wasn’t an event sponsor. 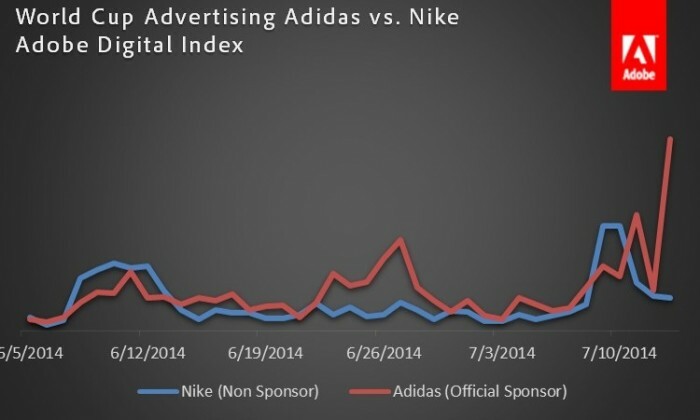 Nike started strong as a non-sponsor, but Adidas averaged 71% more daily championship-related social buzz than Nike. Also part of ADI’s World Cup analysis: the impact of sponsorships on social buzz. Per ADI averages, World Cup sponsors had a 125% daily social buzz increase over the May daily average. In the epic final game on July 13th, Germany’s 22-year old Mario Goetze’s match deciding goal in the second extra time produced 1 million-plus mentions. Germany and Argentina set the pace for the top tier of social mentions of all 32 World Cup squads, with 30 million-plus combined mentions from June through July. CMO.com by Adobe delivers marketing insights, expertise, and inspiration for and by marketing leaders—all aimed at helping CMOs and senior marketers lead their brands in this new digital world. To help marketers stay informed and save time, CMO.com features curated content from more than 150 leading sources. We offer daily exclusive content—thought leadership, interviews with industry leaders, insight, features, news, and slide shows—from across the industry. . .content you won’t find anywhere else. Sports Techie, Our gratitude goes to Adobe for keeping the Sports Techie community blog readers in the ADI and CMO digital content and social media loops, especially with the World Cup, the biggest single-event sporting competition in the world. What began in 1930 on the radio has evolved from black & white television, to color TV, to live International broadcasts watchable on a wireless screen that fits into your hand. German fans are to be given massive credit for supporting what some experts are calling the best National team of all-time, both in person and virtually via mobile usage. For the sporting record, this is the first European team to win a World Cup Championship on South American soil. Argentinian fans, although much closer to Rio De Janeiro, represented well too. As did the millions of American fans and the rest of 32 nations and their loyal fan entourages entered into the grandest of tournaments, from all over the globe. Understanding that 204 countries entered from six continents produced billions of video views, social media interactions and sponsor touches during the 2014 World Cup, is truly an unprecedented digital sports tech historical feat. ESPN did a remarkable job with their WatchESPN app, as did Univision Deportes in Spanish, and I expect Fox Sports to have the same kind of ROI with their Go application for the 2018 Russia World Cup. Bravo to FIFA, the teams and fans, broadcasters and sponsors, for all making it so, as Captain Jean-Luc Picard would say, eh @SirPatStew.